First, let’s back up a second and understand what Conservapedia is. It describes itself as a “conservative, family-friendly Wiki encyclopedia,” “conservative” being defined as someone who “adheres to principles of limited government, personal responsibility and moral values, agreeing with George Washington’s Farewell Address that “religion and morality are indispensable supports” to political prosperity.” Andy Schlafly, son of Phyllis Schlafly, (known best for her opposition to the Equal Rights Amendment and feminism in general), founded it as a response to the perceived “liberal bias” of Wikipedia. The articles have such blatant bias that they almost seem comedic most of the time. For example, the article Barrack Hussein Obama (note the inclusion of the middle name) contains an entire section on evidence that Obama is a muslim, and the central policies are called the Conservapedia Commandments. When I show Conservapedia to friends unfamiliar with it, they usually think it’s a joke like Encyclopedia Dramatica or Uncyclopedia. I warn every man who hears the words of the prophecy of this book: If any man adds to these things, God will add to him the plagues that are written in this book. And if any man subtracts from the words of the book of this prophecy, God will subtract his portion out of the Book of Life, and out of the holy city, and from the things written in this book. The word “Book” here should be “Tree.” It results from the fact that the Conservative Bible is based on the King James Version, which for the end of Revelation was translated from Greek to Latin to Greek to English. The Latin words for book and tree are similar, so that’s probably where the error came from. This is actually theologically significant, since the “Tree of Life” recalls the Garden of Eden and the “Book of Life” creates a new concept, something like “God has a list of people going to heaven in a book,” which I’m pretty sure I heard once or twice in Sunday School growing up. However, the CBP editors clearly didn’t care about a more accurate translation- when an error could not be corrected to make the passage more conservative, it was ignored. It also seems that they didn’t read this passage at all, considering it promises them some significant divine punishment. Isaac Newton claimed that work translating the Bible was responsible for his other insights and those of his contemporaries. Thus, opening this process up to the general public is a major public service. The objective truth “becomes clear with time” through the work of the community. If this claim about Newton is true, the first point is perhaps actually a justification for the project. However, I doubt Newton was translating the Bible with an agenda other than understanding its meaning and am pretty sure it would have been from the original texts. The other two, however, are much more general points about collaboration. In essence, No. 2 and 3 are similar to the concepts governing Wikipedia. Schlafly’s wording just happens to reduce the concept almost ad absurdum. The Conservapedia Constitution opens with the statement: “Editing on Conservapedia is open to the best of the public – and that includes you.” It does not say “and that could be you”- everyone is the best of the public, which renders the term meaningless. 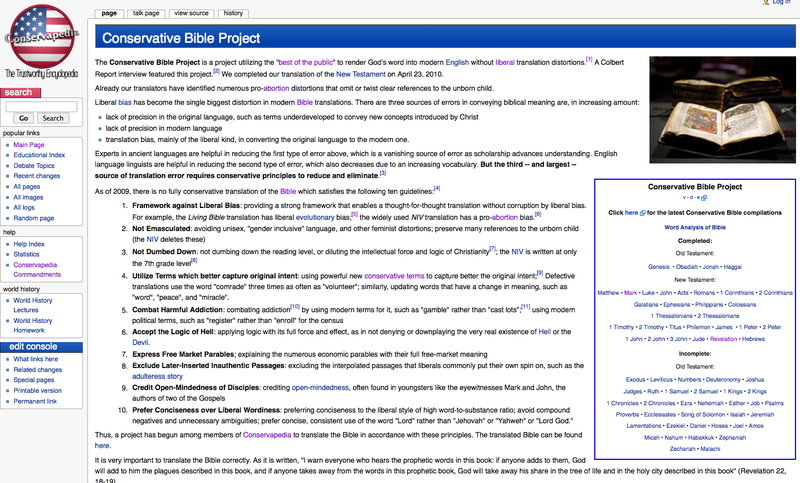 The Conservapedia article Best of the public goes on to list “examples” of the concept, including many amateurs who rose to important status, including New Testament authors, Ronald Reagan, and one-hit wonders. Though the selection is perhaps tailored to a conservative audience (except for examples like “Ice Ice Baby”), this is actually one of the most important sentiments in Internet culture. As the “best of the public” article notes, any amateur can write a blog and dispense important information. Wikipedia also depends on amateurs to synthesize information in an encyclopedic fashion, “encyclopedic” being identified by the myriad of policies, policies which were written by these amateurs. This leads back to the fact that best of the public is presented in an absurd way on Conservapedia, showing an underlying tautology in collaborative web communities: What is reliable information? That which the established members of the community achieve consensus on. Who gets to be an established member of the community? Someone who provides reliable information. Colbert exposed this by having his fans edit him into the Conservative Bible- they created a clearly false consensus, and to overcome this, Conservapedia leaders had to violate the tenets of consensus. An analogous situation would be issues of repeated vandalism in Wikipedia; articles prone to biased editing and vandalism, like “Christianity” and “George W. Bush,” tend to be semi-protected, meaning only established users can edit them. If, however, a large group of people were to register Wikipedia accounts and assert on a discussion page something patently false was in accordance with Wikipedia policy, the community would be hard-pressed to go against the consensus. This generally doesn’t happen, since there are tons of Wikipedia users with a contrary opinion (who probably know Wikipedia policies well enough to cite them by abbreviation like WP:FU and WP:NOR and WP:NOTPAPER; as you can see, I’ve been inside this process). This is actually why Conservapedia formed in the first place; people with extreme conservative views found themselves quickly barred entry by an already-existing community. We can only hope that the community is “right,” since such a gigantic status quo is hard to shift; the policies themselves are built around it. Conservapedia, therefore, is no different from Wikipedia in that regard: an established status quo bars edits that violate the beliefs of the community. It’s just that Wikipedia seems intuitively much more rational to most of us. So now, all of the concepts behind Internet collaboration are tautological. Where does that leave us? Thankfully, there has been some review from outside of the system to help gauge whether it’s working. A study in Nature found that Wikipedia is about as accurate as Encyclopedia Britannica. That can give us some comfort that the system is doing its job and that any community-based inertia isn’t necessarily bad. I don’t think any study has been conducted of Conservapedia or the Conservative Bible. But I’m sure if a study did find Conservapedia to be less than accurate, Conservapedia would happily point out its liberal bias. Really? I haven’t studied linguistics, but I do speak fluent Indonesian and a little Javanese, and I’d say there are many times when the standard way of expressing something in Indonesian and related languages is less precise than the English. The Bible project itself looks awful. I used to study the Bible years ago, as best I could with no significant knowledge of the original languages. I’d compare translations, and use references that referred to the original languages. My strong impression was that most mainstream translations erred on the side of supporting mainstream Christian beliefs, were there was any ambiguity in the possible translation – and maybe sometimes when there wasn’t. I thought the NRSV did the best job, and the NIV was quite conservative and inaccurate in significant ways, that most Christians wouldn’t be aware of because they’d never think to question those assumptions. The NRSV seems to be much less interpretive, and more scholarly. Wikipedia is not bad on the sciences. In the humanities it is very poor. It is either plagiarised from out of date sources, see e.g. here http://ocham.blogspot.com/2010/10/andronicus-of-rhodes.html or in some cases blatantly falsified, see e.g. this http://ocham.blogspot.com/2010/06/avicennian-logic.html . It all depends where you look. Interesting, Peter. So, Nature says Britannica is roughly equal to Wikipedia. Britannica, unsurprisingly rebuts that awful – AWFUL! – claim by saying that the study is fatally flawed. How many times does that have to go back and forth? Of course Brittanica rebutted it. Their business model depends on it.